Fire Roasted Jalapeno Pear Spinach Soup as the name suggest is fired up! Hahaha!!! Not really. 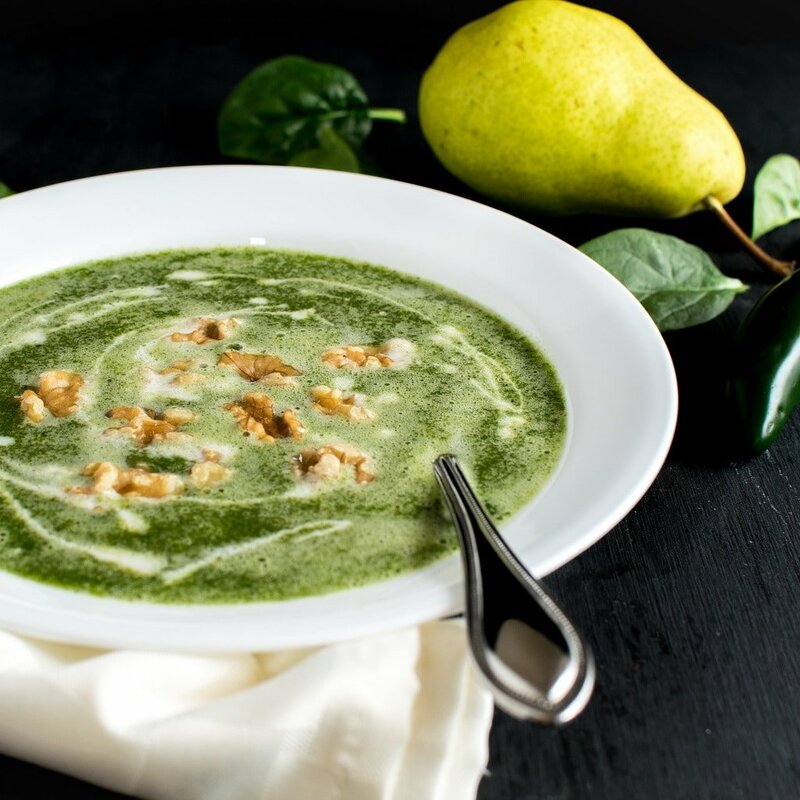 This soup however has smoked flavor of jalapeno and the sweetness of green pear along with the goodness of spinach. Nutritious….isn’t it? It indeed is. This Soup is satisfying and perfect to survive through the chili air. It’s comforting yet tasteful. It’s UBER simple and super flavorsome. However, the real flavor is hidden in the fire roasted jalapeno pepper. Jalapeno pepper when burnt on the stove does wonders to any dish. It uplifts any recipe by not only its aroma but its smoky and fiery flavor as well. I have a weakness for jalapeno and love to cook many recipes with this pepper as and when possible. Of course this soup is for grownups but if your kids are little adventurous then you might try to deseeded the pepper and induce it in the soup. I like my soups to have sweet and savory taste. However, when I spice it up with some chili peppers the soup turns out to be extremely delightful and out of this world. 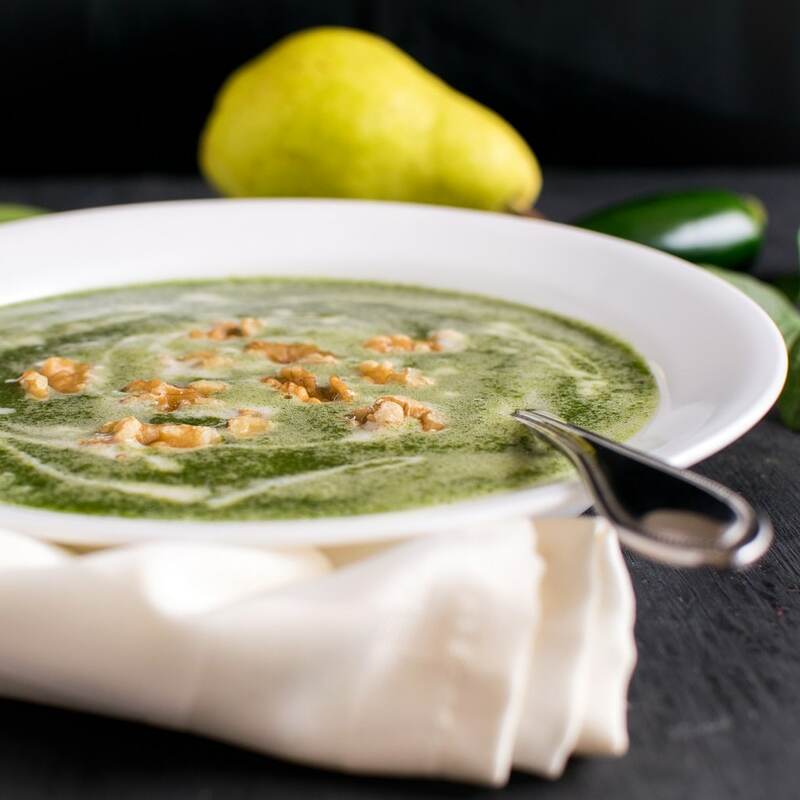 Fire Roasted Jalapeno Pear Spinach Soup is my favorite go to meal especially for my lunches. I usually make extra batches for week nights and just warm it up whenever I just want to grab something already cooked. This soup pairs well with pasta, salad or dinner rolls but feel free to add any sides with it and enjoy this delectable warm meal. This soup is naturally vegan and paleo and absolutely friendly to gluten free diet. 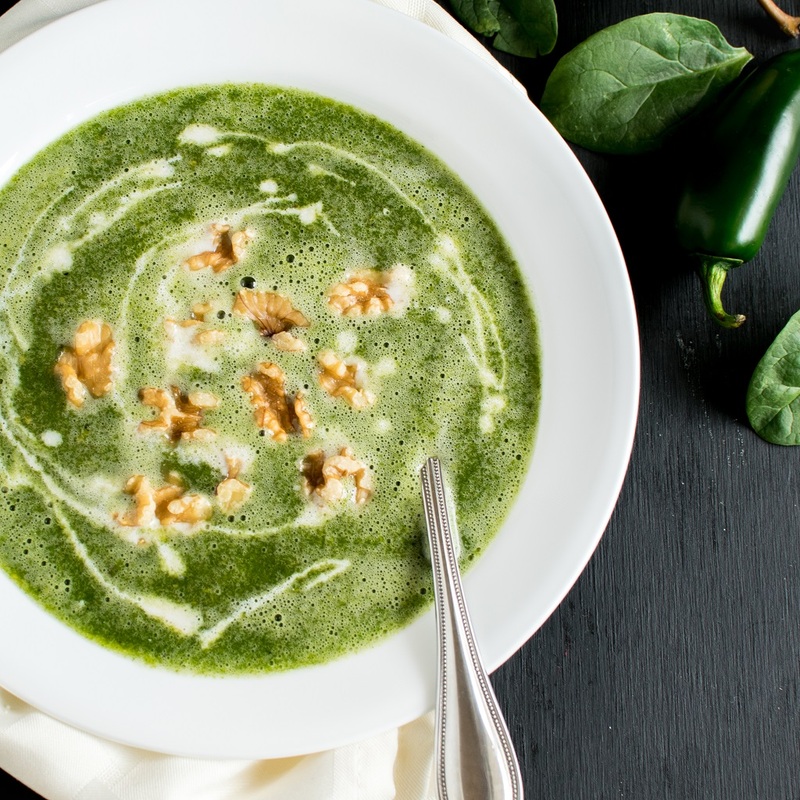 I topped this Fire Roasted Jalapeno Pear Spinach Soup with walnuts and homemade cashew cream. You may use store bought cashew cream if desired. Anyhow, I would recommend using homemade cashew cream because it is super simple. All you need is just two ingredients and a blender for cashew cream. The just use it in any recipe as directed. Cashew cream definitely adds a creamy flavor and presentable appearance of the soup on the table. Well, if you are still wondering on how to fire roast jalapeno pepper just turn on the flame and place the whole jalapeno pepper on the flame with the help of tongs. Be careful while handling the pepper on the open flame. Keep tuning the pepper at intervals so as to roast it from all sides. 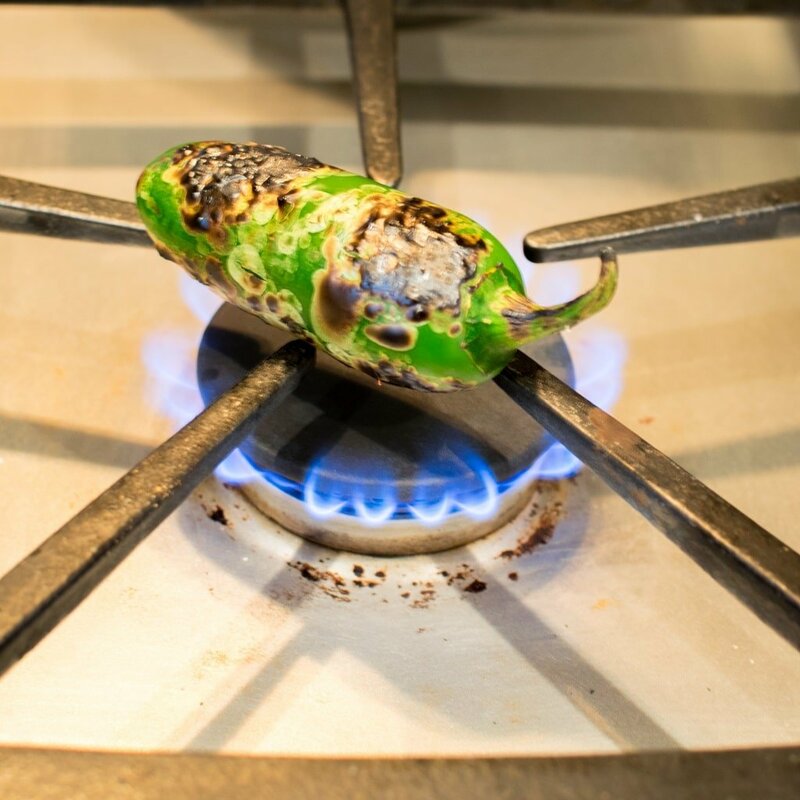 Keep roasting until the skin of jalapeno pepper is almost burnt. Then just chop and blend the soup as directed below. Enjoy Fire Roasted Jalapeno Pear Spinach Soup in your cozy blanket in front of the fireplace and stay warm!!!!! Turn on the flame and with help of tongs roast jalapeno pepper directly on the flame until the skin is well burnt. Let it cool and chop it. In a saucepan combine chopped green pear, baby spinach, chopped jalapeno, vegetable broth and oregano. Cover and cook until pear is soft and mushy. Let the soup cool down and blend it smooth. Add salt if desired and warm it again. Serve the soup in your choice of soup bowl and garnish with walnuts and cashew cream. Loving this spicy pear soup recipe idea! Saving to Pinterest for later–thanks! This sounds like a great combination! Sweet and spicy is my favorite flavor combination, so I bet I would love this. Thank you Willow. I hope you like it as much as we did. The combination of flavours in this soup sounds so good! I will definitely be giving this a try!